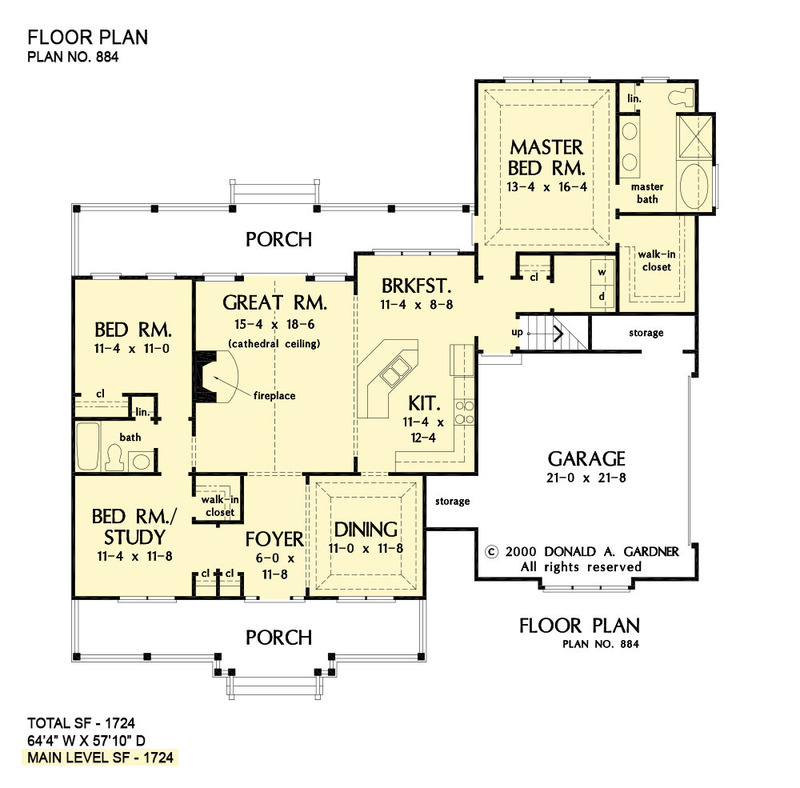 Stylish and sensible, this modest-size home plan makes the most of its square footage and even has a skylit bonus room for expansion. Taking the great room to new heights is a cathedral ceiling, and the master bedroom is crowned with a tray. 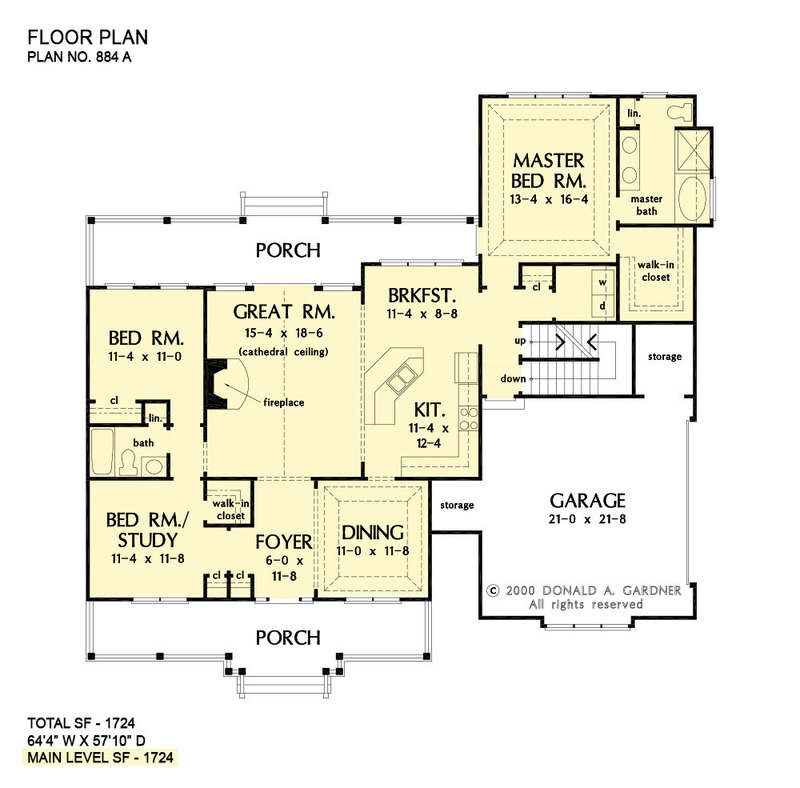 Note the triple windows complementing the breakfast area in this home plan. 1st Floor: 1724 Sq. Ft. 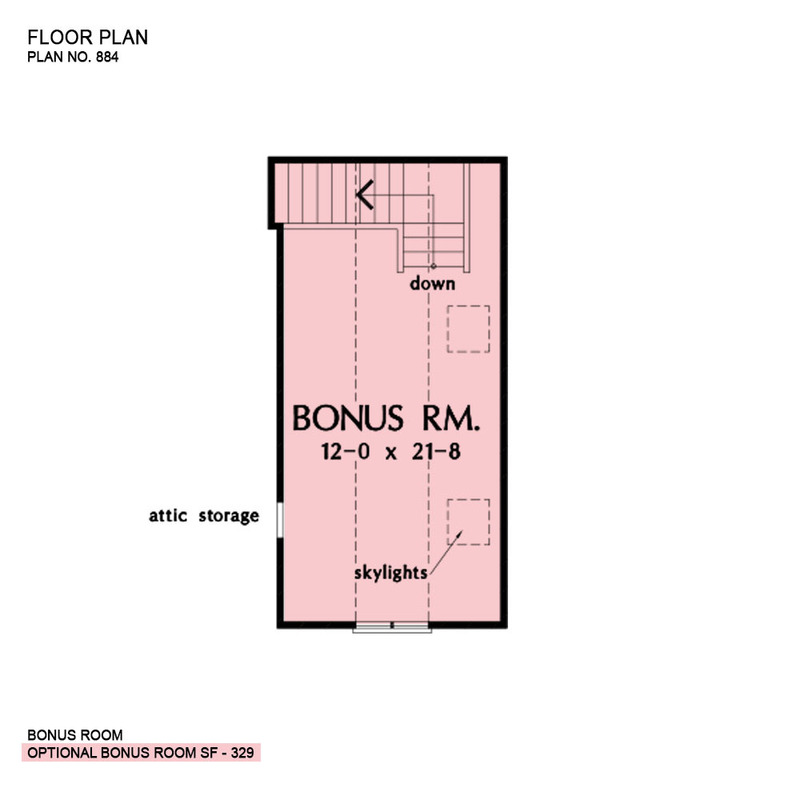 Bonus Room: 329 Sq. Ft.
House Dimensions: 62' 4" x 57' 10"
Great Room: 15' 4" x 18' 6"
Master Bedroom: 13' 4" x 16' 4"
Foyer : 6' 0" x 11' 8" x 9' 0"
Dining Room (Tray): 11' 0" x 11' 8" x 10' 6"
Great Room (Cathedral): 15' 4" x 18' 6" x 18' 6"
Kitchen : 11' 4" x 12' 4" x 9' 0"
Breakfast Room : 11' 4" x 8' 8" x 9' 0"
Utility Room : 6' 0" x 5' 6" x 9' 0"
Bonus Room (Vaulted): 12' 0" x 21' 8" x 9' 0"
Garage : 21' 0" x 21' 8" x 0' 0"
Garage Storage : 9' 0" x 3' 4" x 0' 0"
Master Bedroom (Tray): 13' 4" x 16' 4" x 10' 6"
Bedroom / Study : 11' 4" x 11' 8" x 9' 0"
Bedroom #3 : 11' 4" x 11' 0" x 9' 0"
Porch - Front : 34' 4" x 6' 0" x 0' 0"
Porch - Rear : 39' 0" x 7' 0" x 0' 0"
Storage (Other) : 5' 0" x 5' 0" x 0' 0"